Having recently gone through the process of implementing a custom AADConnect staging installation for a large enterprise customer with more than 30,000 users, with a view to it serving as a fall back to an existing production AADConnect installation. The requirement being to setup an Azure virtual machine running Windows 2016 Datacentre, AADConnect and SQL Server Standard 2017 (locally installed). Rather than SQL Express which comes by default but suffers limitations which preclude its use in large environments. 1GB maximum memory used by the SQL Server Database Engine. The maximum size of each relational database is 10GB. A locally installed SQL Server 2017 instance. The use of a custom group managed account with enterprise administrator rights. Regardless, the requirement here was to make use of a group managed Azure Active Directory account, however this proved stubbornly problematic. With the following errors reported: “Unable to install Synchronization Service” on the installation screen and “The specified directory service attribute or value does not exist.” in the installation logs. Whether the account being used to install the software truly has enterprise administrator rights. Whether the same account has log on and log on as a service rights on the local machine? Whether the account has administrator rights on the local machine? Are you using the latest version of the AADConnect install source? Whether the group managed account as well as the account you are logged in as, has SQL Server ‘sysadmin’ permissions ? Whether port 1433 is accessible on the host? Should this issue persist despite the recommendations above, the workaround is to use an account with Azure global administrator rights (for the installation) instead of a group managed account. The goal of email phishing attacks is obtain personal or sensitive information from a victim such as credit card, passwords or username data, for malicious purposes. That is to say trick a victim into performing an unwitting action aimed at stealing sensitive information from them. This form of attack is generally conducted by means of spoofed emails or instant messaging communications which try to deceive their target as to the nature of the sender and purpose of the email they’ve received. An example of which would be an email claiming to be from a bank asking for credential re-validation in the hope of stealing them by means of a cloned website. Some examples of email Phishing attacks. Take a very close look at the sender’s email address. Phishing email will generally use an address that looks genuine but isn’t (e.g. accounts@paypals.com) or try to disguise the email’s real sender with what looks like a genuine address but isn’t using HTML trickery (see below). Is the email addressed to you personally? Companies with whom you have valid accounts will always address you formally by means of your name and surname. Formulations such as ‘Dear Customer’ is a strong indication the sender doesn’t know you personally and should perhaps be avoided. What web address is the email trying to lure you to? Somewhere within a phishing email, often surrounded by links to completely genuine addresses, will be one or more links to the means by which the attacker is to steal from you. In many cases a web site that looks genuine enough, however there are a number of ways of confirming it’s validity. Hover your cursor over any link you receive in an email before you click it if you’re unsure because it will reveal the real destination sometimes hidden behind deceptive HTML. Also look at the address very closely. The deceit may be obvious or well hidden in a subtle typo (e.g. accouts@app1e.com). a. Be wary of URL redirection services such as bit.ly which hide the ultimate destination of a link. b. Be wearing of very long URLs. If in doubt do a Google search for the root domain. c. Does the email contain poor grammar and spelling mistakes? d. Many times the quality of a phishing email isn’t up to the general standard of a company’s official communications. Look for spelling mistakes, barbarisms, grammatical errors and odd characters in they email as a sign that something may be wrong. Implement robust email and web access filtering. Deploy an antivirus endpoint protection solution. Deploy Phishing attack aware endpoint protection software. Of the many attacks, hacks and exploits perpetrated against organisations. One of the most common vulnerabilities businesses face and need to guard against is the result of the general goodness or weakness, depending on how you choose to look at it, of our human natures exploited through means of social engineering. Social engineering is a very common problem in cyber security. It consists of the simple act of getting an individual to unwittingly perform an unsanctioned or undersirable action under false pretenses. Whether granting access to a system, clicking a poisoned link, revealing sensitive information or any other improperly authorised action. The act relies on the trusting nature of human beings, their drive to help and work with one another. All of which makes social engineering hard to defend against and detect. Now do something about it! As threats to orginisation’s cyber security go. 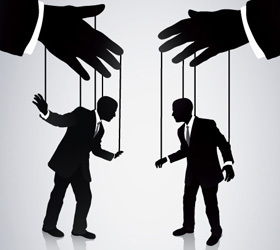 Social engineering is a significant and prevalent threat, and not to be under-estimated. However the following are some of the more effective means of guarding against it. Be vigilent over the phone, through email and online. Be healthily skeptical and aware of your surroundings. Always validate the requestor’s identity before considering their request. Validate the request against another member of staff if necessary. Use different logins for all resources. Use multi-factor authentication for all sensitive resources. Run social engineering simulation exercises across your organisation. Ultimately of course the desired outcome of trying to bolster your’s organisation’s ability to detect a social engineering attack. Is a situation where the targeted user isn’t fooled by the attempt against their trust and performs accordingly, such as knowing not to click the link in an email purporting to help them retrieve their lost banking details for example. Approach all unsolicited communications no matter who the originator claims to be with skepticism. Pay close attention to the target URL of all links by hovering your cursor over them to hopefully reveal their true destination. Look to the HTTPS digital certificate of all sensitive websites you visit for identity information. Use spam filtering, Antivirus software and anti-phising software. Newly published research from security firm Rapid7 is painting a worrying picture of hackers and malicious actors increasingly looking for new vectors against organizations with resources hosted in public cloud infrastructure environments. The six cloud providers in our study make up nearly 15% of available IPv4 addresses on the internet. 22% of Softlayer nodes expose database services (MySQL & SQL Server) directly to the internet. Web services are prolific, with 53-80% of nodes in each provider exposing some type of web service. Digital Ocean and Google nodes expose shell (Telnet & SSH) services at a much higher rate – 86% and 74%, respectively – than the other four cloud providers in this study. A wide range of attacks were detected, including ShellShock, SQL Injection, PHP webshell injection and credentials attacks against ssh, Telnet and remote framebuffer (e.g. VNC, RDP & Citrix). Findings included nearly a quarter of hosts deployed in IBM’s SoftLayer public cloud having databases publicly accessible over the internet, which should be a privacy and security concern to those organization and their customers. Many of Google’s cloud customers leaving shell access publicly accessible over protocols such as SSH and much worse still, telnet which is worrying to say the least. Businesses using the public cloud being increasingly probed by outsiders looking for well known vulnerabilities such as OpenSSL Heartbleed (CVE-2014-0160), Stagefright (CVE-2015-1538) and Poodle (CVE-2014-3566) to name but a few. Digging further into their methodologies, looking to see whether these were random or targeted. It appears these actors are honing their skills in tailoring their probes and attacks to specific providers and organisations. Rapid7’s research was conducted by means of honey traps, hosts and services made available solely for the purpose of capturing untoward activity with a view to studying how these malicious outsiders do their work. What’s more the company has partnered with Microsoft, Amazon and others under the auspices of projects Heisenberg and Sonar to leverage big data analytics to mine the results of their findings and scan the internet for trends. Case in point project Heisenberg saw the deployment of honeypots in every geography in partnership with all major public cloud providers. And scanned for compromised digital certifcates in those environments. While project Sonar scanned millions of digital certificates on the internet for sings of the same. However while the report leads to clear evidence showing that hackers are tailoring their attacks to different providers and organisations. It reads as somewhat more of an indictment of the poor standard of security being deployed by some organisations in the public cloud today. Than a statement on the security practices of the major providers. The 2016 national exposure survey. Read about the Heisenberg cloud project (slides). The existence of a new and potentially serious privilege escalation and password reset vulnerability in Azure Active Directory Connect (AADC) was recently made public by Microsoft. Fixing the problem can be achieved by means of an upgrade to the latest available release of AADC 1.1.553.0. Azure Active Directory Connect as we know takes care of all operations related to the synchronization of identity information between on-premises environments and Active Directory Federation Services (ADFS) in the cloud. The tool is also the recommended successor to Azure AD Sync and DirSync. The update addresses a vulnerability that could allow elevation of privilege if Azure AD Connect Password writeback is mis-configured during enablement. An attacker who successfully exploited this vulnerability could reset passwords and gain unauthorized access to arbitrary on-premises AD privileged user accounts. In this case as stated by Microsoft the risk consists of a situation where a malicious administrator resets the password of an active directory user using “password writeback”. Allowing the administrator in question to gain privileged access to a customer’s on-premises active directory environment. Password writeback allows Azure Active Directory to write passwords back to an on-premises Active Directory environment. And helps simplify the process of setting up and managing complicated on-premises self-service password reset solutions. It also provides a rather convenient cloud based means for users to reset their on-premises passwords. Users may look for confirmation of their exposure to this vulnerability by checking whether the feature in question (password writeback) is enabled and whether AADC has been granted reset password permission over on-premises AD privileged accounts. CVE reference number CVE-2017-8613 was attributed to the vulnerability. Are There Sufficient Standards in Cloud Computing Today? The hybrid cloud may be a hot topic with adoption growing faster than ever but should we be concerned about a lack of established standards? Private clouds, whether owned or leased, generally consist of closed IT infrastructures accessible only to a business which then makes available resources to it’s own internal customers. Private clouds are often home to core applications where control is essential to the business, they can also offer economies of scales where companies can afford larger, long term investments and have the ability to either run these environments themselves or pay for a managed service. Private cloud investments tend to operate on a CAPEX model. Public clouds are shared platforms for services made available by third parties to their customers on a pay-as-you go basis. Public cloud environments are best suited to all but the most critical and expensive applications to run. They offer the significant benefit of not requiring large upfront capital investments because they operate on an OPEX model. Hybrid clouds on the other hand are made up of a mix of both types of resources working together across secured, private network connections. They can offer the benefits of both models but run the risk of additional complexity and can lessen the benefits of working at scale. With an ever growing number of businesses seeking to adopt a multi-cloud / multi-vendor strategy, the potential benefits of this new take are clear. It’s an approach which offers increased resiliency and the best in feature sets while minimizing lock-in; albeit at the cost of having to manage more complex infrastructure and billing structures. However in the absence of standards, cloud providers and hardware vendors have been building proprietary stacks with little common ground which is stymying the movement of applications and workloads across clouds and represents a challenge for business up-take. So it seems clear that a gap in cloud computing standards and insufficient overlap among hardware vendors of private cloud technologies has been hampering adoption something which needs to be addressed. Generally speaking standards follow market forces, particularly where the pace of innovation is fairly rapid, in a market of this size however they will undoubtedly catch up eventually. Case in point a number of standards are expected be finalized reasonably soon and reach the industry inside the next couple of years from organizations such as the IEEE Standards Association, Cloud Standards Coordination, The Open Networking User Group and others which will be a welcome development and a significant asset for the industry. Some additional information about these organizations. “The IEEE Standards Association (IEEE-SA) is a leading consensus building organization that nurtures, develops and advances global technologies, through IEEE. We bring together a broad range of individuals and organizations from a wide range of technical and geographic points of origin to facilitate standards development and standards related collaboration. With collaborative thought leaders in more than 160 countries, we promote innovation, enable the creation and expansion of international markets and help protect health and public safety. Collectively, our work drives the functionality, capabilities and interoperability of a wide range of products and services that transform the way people live, work and communicate.” – IEEE Standards Association. “The Cloud Standards Customer Council (CSCC) is an end user advocacy group dedicated to accelerating cloud’s successful adoption, and drilling down into the standards, security and interoperability issues surrounding the transition to the cloud. The Council separates the hype from the reality on how to leverage what customers have today and how to use open, standards-based cloud computing to extend their organizations. CSCC provides cloud users with the opportunity to drive client requirements into standards development organizations and deliver materials such as best practices and use cases to assist other enterprises. Cloud Standards Customer Council founding enterprise members include IBM, Kaavo, CA Technologies, Rackspace & Software AG. More than 500 of the world’s leading organizations have already joined the Council, including Lockheed Martin, Citigroup, Boeing, State Street Bank, Aetna, AARP, AT&T, Ford Motor Company, Lowe’s, and others.” – Cloud Standards Customer Council. “The ONUG Hybrid Cloud Working Group framework seeks to commoditize infrastructure and increase choice among enterprise buyers of public cloud services. The goal is to have a framework, which identifies a minimum set of common issues and collective requirements that will swing leverage into the hands of enterprise buyers of hybrid cloud services. The Open Networking User Group (ONUG) was created in early 2012 as the result of a discussion between Nick Lippis, of the Lippis Report, and Ernest Lefner, about the need for a smaller, more user-focused open networking conference. From there, the two brought together the founding board of IT leaders from the likes of Bank of America, Fidelity Investments, JPMorgan Chase, UBS, and Gap Inc. Managed by Nick, the board worked together to create the first ONUG event, held on February 13, 2013 at the Fidelity Auditorium in Boston, Massachusetts. – The Open Networking Users group. Thanks to the good folks at Neverware, you can now run Google’s cloud centric OS on a wider range of hardware than just Chromebooks alone. To enable this, what Neverware have done is repackage Google’s Chromium operating system. This OS is at the core of it’s range of branded laptops, and is now made available to all. CloudReady running on different hardware. Where Google build and maintain open source versions of Android and Chromium, their real value proposition is to add proprietary features onto both before selling them on branded devices. Enter CloudReady, based entirely on the open source core of Chromium making it a vanilla experience. Given it’s nature, not all features of are available in the first release, an example of this is Powerwash and the Trusted Platform Module. A full list of differences is available from Neverware of course. Updates to CloudReady are delivered in a similarly transparent manner to the OS as with Chromium, however these updates are available by Neverware, and not Google. CloudReady is also several major releases behind Chromium, for reasons owing to development. it it worth noting that Neverware have somewhat boldly committed to “indefinite” support for the OS. Neverware are focused on generating revenue through selling devices, and OS licenses, as well as support to education and the enterpise at a later date. The caveat, however is there is currently no official support for the free version, you will have to look to community support through their user forum. 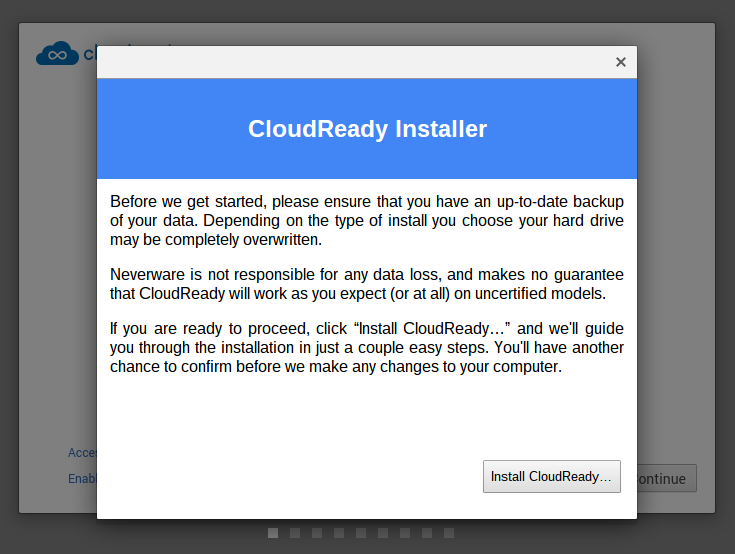 CloudReady is available for download from Neverware. Installing it is just matter of creating a USB based installer from, which to boot and launch the process. This procedure is supported on a Chrome OS, Windows or Mac devices. Now that you havecreated the source media, you will then need to reboot the target system, and have it boot from the relevant USB port by applying the required BIOS settings. 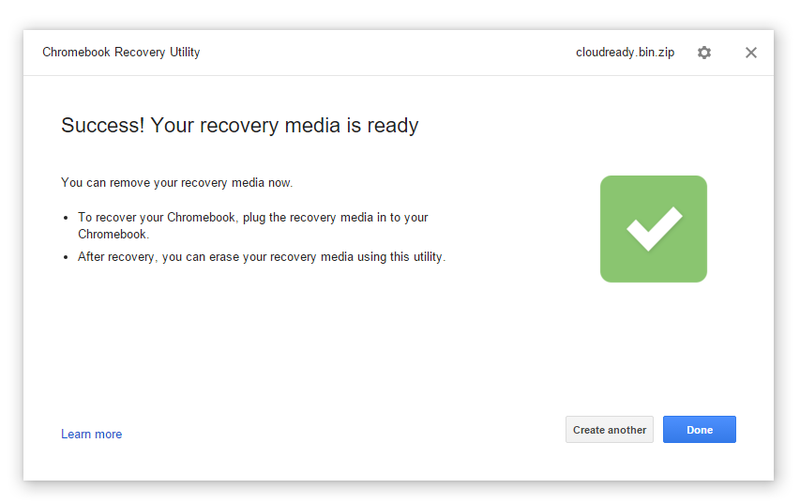 Alternatively CloudReady can also be dual booted alongside other operating systems. Detailed installation instructions are available from their web site. Neverware have made available a number of useful hardware support lists including. Neverware is a venture-backed technology company that provides a service to make old PCs run like new. In February 2015 the company launched its second product, CloudReady; an operating system built on Google’s open source operating system Chromium. I was called upon recently to help a customer create copies of some of their Windows virtual machines. The idea was to quickly deploy copies of these hosts at any time as opposed to using a system image or point in time copy. The following PowerShell will therefore allow you to make a copy or clone of a Windows virtual machine using a copy of it’s disks in Azure Resource Manager mode. Having finalized the configuration of the source virtual machine the steps required are as follows. Stop the source virtual machine, then using Storage Explorer copy it’s disks to a new location and rename them in line with the target name of the new virtual machine. 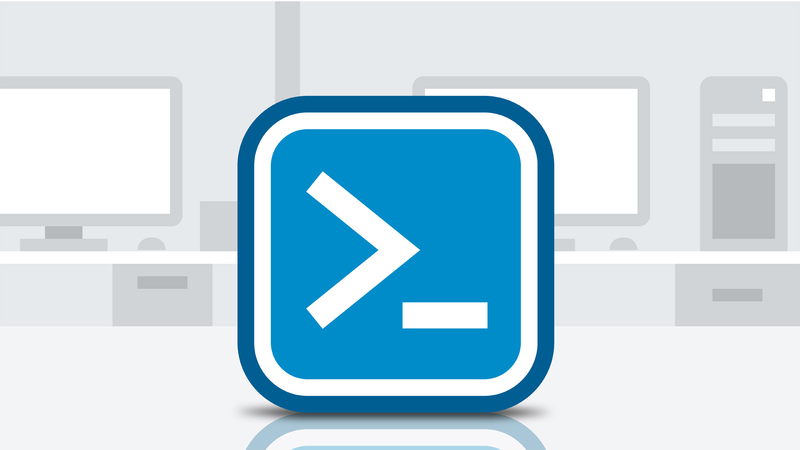 Run the following in PowerShell making the required configuration changes. Notes: The URIs above belong to the copies not the original disks and the SubnetID refers to it’s resource ID. $osDiskName = $vmName + "os-disk"
$dataDiskName = $vmName + "data-disk"
List virtual machines in a resource group. Having run the above. Log on to the new host in order to make the required changes. A pair of studies published a few days ago by global management consulting firm McKinsey & Company entitled IT as a service: From build to consume show enterprise adoption of Infrastructure as a Service (IaaS) services accelerating increasingly rapidly over the next two years into 2018. Of the two, one examined the on-going migrations of 50 global businesses. The other saw a large number of CIOs, from small businesses up to Fortune 100 companies, interviewed on the progress of their transitions and the results speak for themselves. 1. Compute and storage is shifting massively to cloud service providers. Compute and storage is shift massively to the cloud service providers. With on-premise storage and server sales growth going into negative territory, it’s clear the next couple of years will see the hyperscalers of this world consume an ever increasing share of global infrastructure hardware shipments. 2.Companies of all sizes are shifting to off-premise cloud services. Companies of all sizes are shifting to off-premise cloud services. The report also anticipates the number of enterprises hosting at least one workload on an IaaS platform will see an increase of 41% in the three year period to 2018. While that of small and medium sized businesses will increase a somewhat less aggressive 12% and 10% respectively. 3. A fundamental shift is underway from a build to consume model for IT workloads. Another takeaway is that the share of traditional and virtualized on-premise workloads will shrink significantly from 77% and 67% in 2015 to 43% and 57% respectively in 2018. While virtual private cloud and IaaS will grow from 34% and 25% in 2015 to 54% and 37% respectively in 2018. McKinsey & Company is a worldwide management consulting firm. It conducts qualitative and quantitative analysis in order to evaluate management decisions across the public and private sectors. Widely considered the most prestigious management consultancy, McKinsey’s clientele includes 80% of the world’s largest corporations, and an extensive list of governments and non-profit organizations.